perhapablog... and other ramblings: the show! 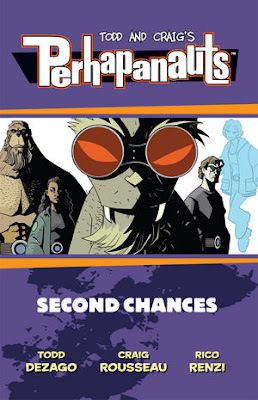 THE PERHAPANAUTS: SECOND CHANCES tpb is NOW ON SALE! needless to say, craig and i were ecstatic to receive our copies of the trade in time to have them for sale down at heroescon in charlotte! it was so nice to have them available and to see so many enthusiastic readeres! thanks for coming out, everybody--you made the new trade a big, big hit! 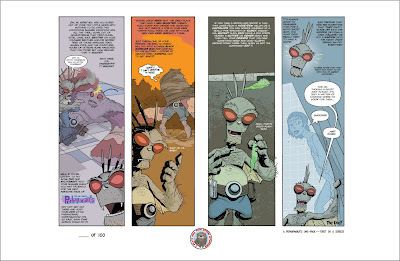 also a big hit was our very first perhapanauts one-page! they were selling like hotcakes and we were amazed at how many people stopped to give it a read. and then laugh. we did bring a couple home with us though and i will be making them available here on the blog and on the website as soon as i figure out a shipping strategy! as for my run-down, this is gonna be brief because i want to include all of my pictures. and a bunch of scott's. thursday i jetted down to mike's house in raleigh-durham, although my plane was delayed two hours and cut into our hangin' out time. missed a chance to have lunch (and indian at that!) 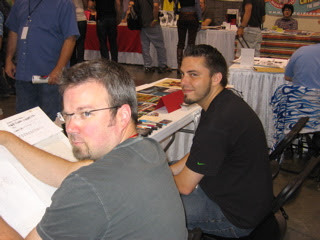 with our old pal and sensational spider-man inker rich case. damn you, usair! got to mike's and helped him pack the last of his stuff and got to play with charlie whom i hadn't seen for a year! 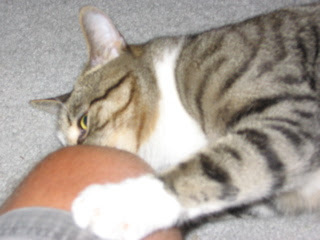 this cat is just so cool--very playfiul and affectionate! friday started really well and it was great to seet up and get in the groove. craig arrived late in the afternoon as it was also johnny's birthday and he took a noon plane down. craig and rico--i said, "hey! you guys!--look!" 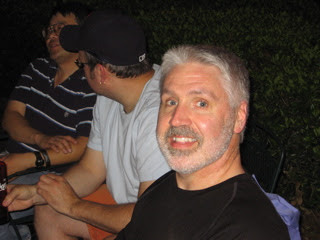 friday night was dinner--check out matt's blog for that--and then back to the hotel bar. 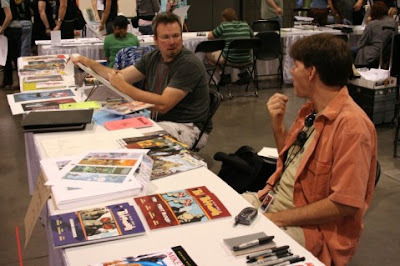 got a chance to meet and chat with a lot of friends; scott, abby, and chris, andy kuhn,karl story, jan jones, kelly yates, jonboy meyers, cully hamner, jeff parker, baltimore con organizer, marc nathan and his lovely fiance, shelly. 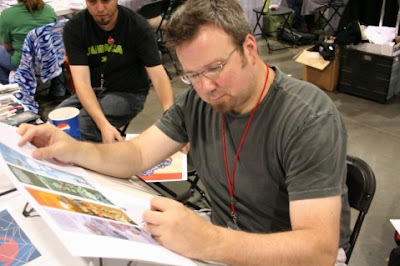 and especially gorilla brother, barry kitson. poor barry. the airlines lost his luggage coming over from the uk and it didn't show up until hours before he was scheduled to leave on sunday. what a trooper, though, wearing walmart the whole weekend and making it look good! (i kick myself for not getting a photo of brian and bill for the benefit of the blog--i don't think they were around when my camera was out.) fortunately, scott had his camera out and got this shot of me and megan, our super-booth girl! 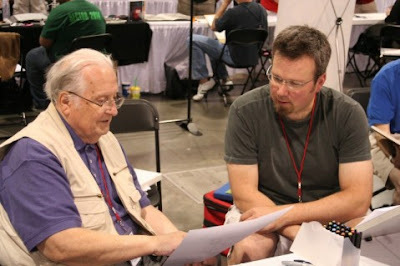 of course, on eof the other highlights of the show waas that i got to spend some great time with my hero and mentor, nick cardy. he, as well as his niece/business manager, marianne, were nice enough to have dinner and breakfast with us several times during the show. 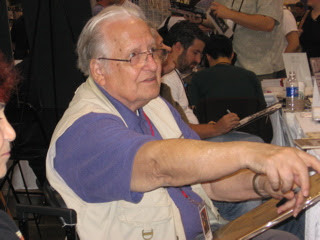 nick is wonderful and regaled us all with stories from his incredibly colorful life. 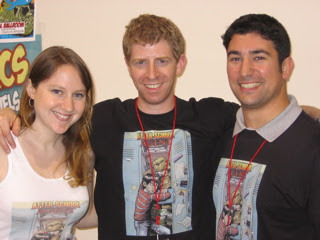 really the most exciting thing for me at the show this year was, by far, the fact that my pal and writing partner, scott weinstein, was there with his hot-off-the-presses premier copy of AFTER SCHOOL AGENT #1! i was so excited for him and could see the thrill in his eyes the whole time at having something to show for all of his hard work. it's been a year or so since scott first started looking for someone to draw his adolescent adventurer--and i feel bad that i led him down several dead-ends in that department--only to find his perfect match in his long time friend, chris zaccone! chris's style makes gordon even more magic and i can't recommend this book enough! 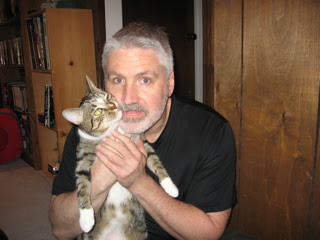 also along for the ride, and certainly a member of the after school agent pr team, was scott's new girlfriend, abby, who, i will say here in print, scott--is a doll! great to meetcha, abby! hope to see you guys soon! 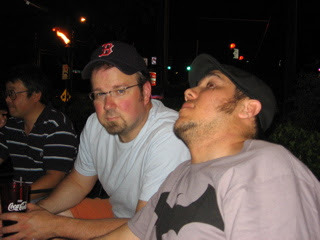 sunday night was the dead dog party at--i don't even KNOW the name of the pizza place/bar across the street from shelton drum's (heroscon organizer) comic shop heroes aren't hard to find. this is usually a good chance to unwind, listen to some music, and catch up with some of the people you didn't get to talk with during the show. craig and cheeks--i told sean to get closer to craig. Great report/pix, Todd. I totally missed out on the After School Agent postcard, tho'... Dang! At least I got to buy the comic, and I really enjoyed that. If I hadn't already pre-ordered the second 'Haps trade, I definitely would have purchased one at Heroes Con just to have the entire creative team AND Officer Mulcahy sign it. But I'm sure you appreciate the pre-orders through Diamond, too. Looking forward to Baltimore. I'll be there with my older daughter, so my con time will be limited, but we will definitely stop by to say hi. 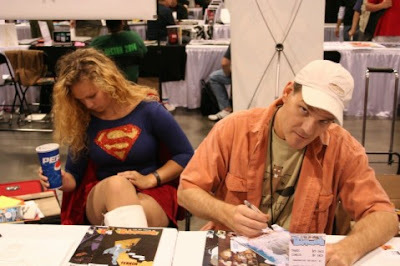 I actually did sign my first autograph at the con and it was for, of all people, Supergirl's Dad who was standing behind me in the Barry Kitson Line. Thanks for the rundown of the show Todd! Sounds like it was a blast, which means I'll really have to try to make next years! When's the Baltimore show? Maybe I'll try to make that one this year. And when you have info on the One-pagers, let us know, I'd love to get one man! Nice recap. Yeah, Heroes was an amazing time. Thanks to everyone from here who stopped by the booth,especially Bill and Brian. Todd, thanks for the kind words. Chris and I couldn't have been happier with the reaction to After-School Agent. I loved going as a guest last year. And being behind the table this year was a blast. I will be back next year. Abby loved meeting everyone too. (Yeah, she is a a doll, isn't she) And I have to thank her again. Not only was she extremely helpful and gave us lots of great advise. She went above and beyond, spending hours at the table, considering she had no interest in comics before we started dating. And congrats on the second trade. I picked it up yesterday and it looks fantastic. I love the reprint of the full-color spectacular special from years ago, which contains my favorite comic gag. The fake Hostess pie ad seemlessly woven into the story. Great recap, Todd. Sounds like you had a ton of fun. 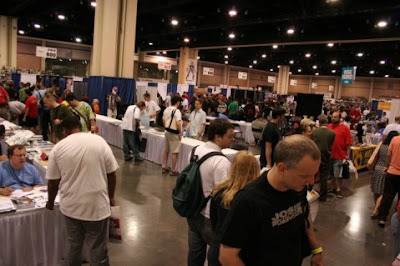 I'm thinking about going to some different cons in the coming years... maybe Heroescon next year....? 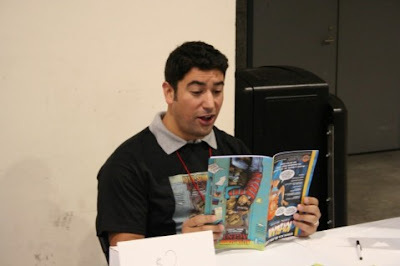 I've got my Perhapanauts trade coming to me through DCBS! 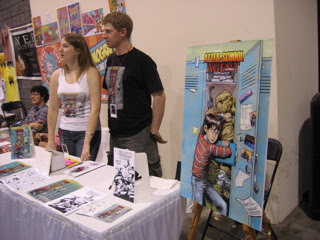 oh yeah... Scott... how would one get his hands on a copy of After-School Agent? A great show indeed, Todd. I wish I had been feeling better, so's I could've hung out with you and the rest of the 'Ringo gang more. Also, wish I'd brought my copies of the 'Perhapanauts' for your moniker. Next year...at least I scored a commission from Craig. yeah, i think we referenced southern culture in issue 1 and in the even more fun two-pager that we did! it's one of the bands that molly listens to! and me and craig too!! woo hoo! i would think that "8 piece box" would be a nastier clean up though--they were throwin' chicken legs into the crowd! They played 'Eight Piece Box' that night, too, Todd. I had the double-whammy to clean up—puddin' and bones, but well worth it. (I used to bar-back for giggles.) I was hooked. Now we're spreadin' the gospel to all our friends. Even got my parents on the 'Liquored up and lacquered down' bandwagon. Good stuff to anyone interested. Thanks for the update Todd! And I don't know about you guys, but I for one am excited to see the return of Mike's Beard! Awesome! Kenny Loggins like a mutha — hush your mouth! But I'm talking 'bout Ringo? !